Concepts of utopia and dystopia in nineteenth-century Europe. Neil Bertram, James Mayer and Liam Pietrasik, third year history students at the University of Portsmouth, wrote the following blog entry on the ways in which science and technology combined between the years of 1880 and 1914 to foster fears of a dystopian society, along with creating dreams of a utopian future. Their research was undertaken as part of a final year group research project. The unit is co-ordinated by Dr Robert James, Senior Lecturer in Social and Cultural History at Portsmouth. Concepts of utopia and dystopia represent imaginary societies in which people live either in a perfect environment, governed by the laws which provide happiness to everyone, or in an oppressive society under repressive state control. With social investigators publishing reflections of society, these were taken up by social commentators to project future visions. Authors imagined dark visions of the future where totalitarian rulers governed the life of ordinary citizens. Their works explored many themes of dystopian societies – repressive social control, influence of technology, freedom of speech, censorship and class distinctions. Three strands of research were undertaken as part of the research project: Visions of the Future, Social Degeneration, and Fear of Technology. Linking the findings concludes that there was a greater preponderance of dark visions of a bleak, dystopian future rather than the utopian dream. ‘Visions of the Future’ can be assessed through social commentators in novels and caricatures. Social investigator, Jack London, observed one fear as an uprising of the poor. London used his investigations of the poor and downtrodden in The People of the Abyss to form the basis of capitalism suppressing people in The Iron Heel. What can be seen from the historiography is little agreement on whether The Iron Heel represents a utopian or dystopian view. Alessandro Portelli suggests London projected the utopian hopes of a fledgling working-class movement; whereas Francis Shore claimed that London’s focus was on “dystopian realities rather than utopian possibilities”. Industrialisation and urbanisation played a major part in peoples’ response to the march of modernity. In 1886 newspapers reported “Panic in London” where ‘large masses’ met ‘social control’ in the form of ill-equipped police. ‘The Police of the Future’ cartoon emphasised the merging of police and military, and responding to the accusation of being ill-equipped. The cartoon appeared seven days after the London “Black Monday” riot which The Times described as the most “alarming and destructive…within living memory”. To ‘respectable’ Victorians over-armament of the police was needed to quell insurrection. To the ‘deviants’ the depiction was of puppets of the state with their weapons of oppression. William Morris used social investigators and real events to project his ‘vision of the future’. With News from Nowhere, Morris drew on his participation in Black Monday reflecting that it was a fight against state enforcers. He shows the future as utopian journeying through dystopia. In a further riot in November 1887 on “Bloody Sunday”, William Morris was present, witnessing the “shocking brutality” of soldiers and policemen. Phillippa Bennett described ‘Black Monday’ as the warm-up and Bloody Sunday as the dress rehearsal for revolution. Jack London also made the connection as “the First Revolt was premature….the Second Revolt….was doomed to equal futility”. 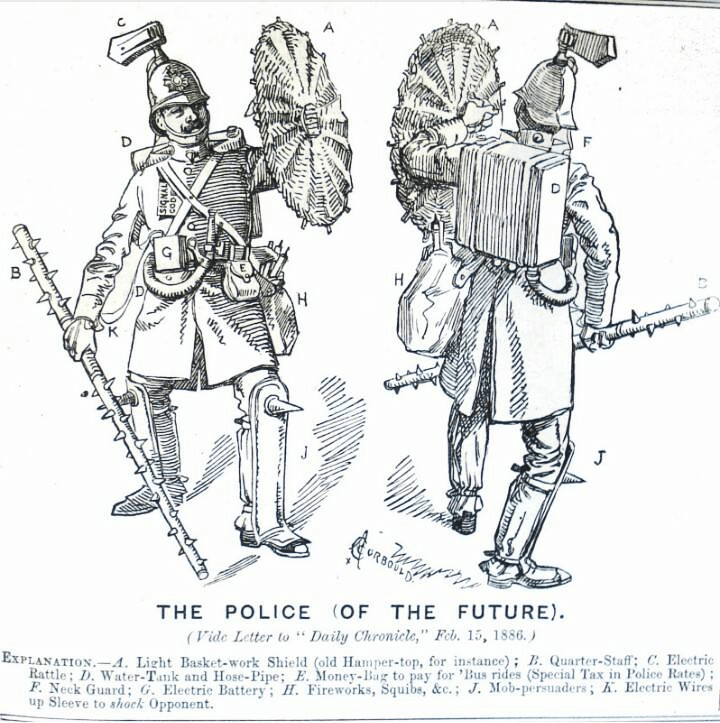 The depiction of the future ‘Police’, Iron Heel and News from Nowhere hold a mirror up against 1880 to 1914 and reflect dystopia, yet sometimes hiding behind utopian dreams. Reflecting on ‘Social Degeneration’ the Victorians viewed “that sections of the population were gradually accumulating deleterious traits or overt diseases which they passed to their offspring”. In William Booth’s 1890 text In Darkest England and the Way Out, he describes the poor in London’s districts as “a population sodden with drink, steeped in vice” and are “the denizens of Darkest England”. This group of people were thought to be the “Achilles heel of a project dedicated to progress”. Unless something was done, society would be contaminated, regress, and fall back to more primitive shapes. Social commentators such as H.G. Wells drew on these issues and projected them to a wider audience. 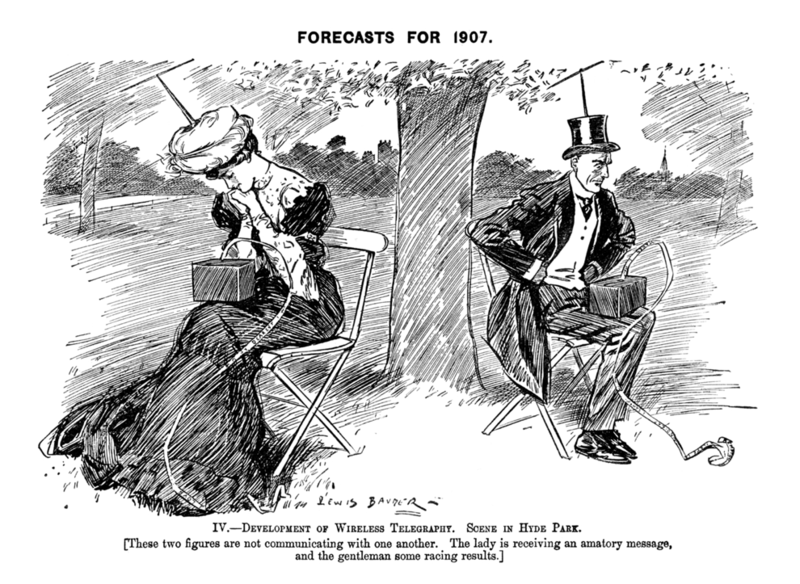 Wells’ The Time Machine offered an analysis of future society based on the class divisions within the Victorian society. Wells projected that naivety towards problems would do nothing but condemn humanity to a degenerative future of “carnivorous Morlocks”. In doing so, Wells mirrored the work of early investigators who saw the East End working-class district as a place of simply savage, deviant, and grotesque beings, “not unlike those found in the wilds of Africa”. A dystopian future loomed over Victorian society with Wells’ visions of the future coupled with slum investigators’ depictions of the present. Biologists such as Edwin Lankester and Max Nordau put a scientific stamp on contemporary anxieties surrounding the degeneration of society. Lankester spoke of “the decline of the white races into parasitism, and in his 1880 text Degeneration: A Chapter in Darwinism, pronouncing that society must “protect this English branch from relapse and degeneration”. Social investigators such as Booth and Mayhew raised the question of degeneration of London society, social commentators projected these fears to wider audience with Darwin, Lankester and Nordau putting a scientific stamp on these fears. Without a means to stop this degeneration, a dystopian future loomed over Victorian society. 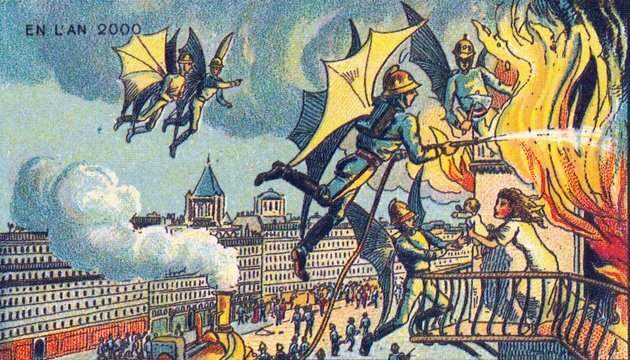 The period between 1880 and 1914 shows a rise in dystopian beliefs. This was in reaction to a rapidly changing social, industrial and techno-scientific landscape. Dark visions permeated visons of the future, with respect to social degeneration and fear of technology. The period is a fin de siècle reaction to, and fear of, modernity. Decline, degeneration, new political thought, science and inventions, social studies of the poor, disease and insecurity fuelled dystopian anxieties which pervaded the news, arts, literature, philosophy and even fear of each other through eugenics and Social Darwinism. The visions of the future manifested themselves through social commentators writing dystopian novels and general reflections in newspapers. Social investigators’ studies of city degeneration show the consequences of allowing the dark underworld a foothold in society. They serve as a graphic, dystopian warning that society is heading in the wrong direction. At the same time science and technology should have pointed the way to a utopia filled with labour saving devices, transport and bright housing, yet fear of the ‘new’ stifled aspirations. 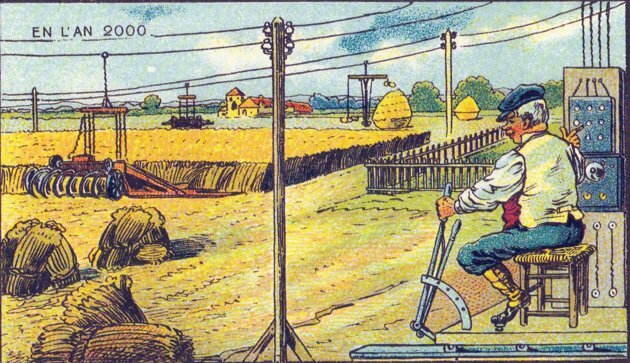 Optimism turned to pessimism when the realisation dawned that technology could destroy as well as enhance life. Any utopian dreams were finally destroyed, with the advent of the First World War. Savagery, technological weapons and state conscripted soldiers showed the social commentators were correct in their dystopian visions. 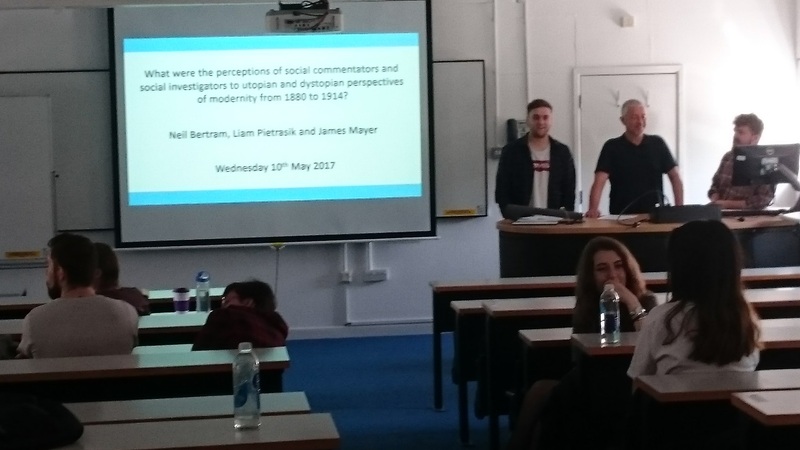 Neil Bertram, James Mayer and Liam Pietrasik getting ready to present their findings to some of the final year cohort. Image author’s own. Stephen Kern, The Culture of Time and Space 1880-1918, 2nd ed. (Cambridge: Harvard University Press, 2003), 215. Gregory Claeys, “The origins of dystopia: Wells, Huxley and Orwell,” in The Cambridge Companion to Utopian Literature, ed. Gregory Claeys (Cambridge: Cambridge University Press, 2010), 112. Zoltán Kádár and Tóth I. Jano,s “The critique of technology in 20th century philosophy and dystopia,” Procedia – Social and Behavioural Sciences 71, No. 1 (2013): 53. Gorman Beauchamp, “Technology in the Dystopian Novel,” Modern Fiction Stories 32, No. 1 (1986): 53. Michael Paris, “Fear of Flying: The Fiction of War,” History Today 43, No. 6 (1993): 29. Christopher Lawrence, ‘Degeneration Under the Microscope at the fin de siècle’, Annals of Science, 66, No. 4 (2009): 455. William Booth, In Darkest England and the Way Out (London: Funk and Wagnalls, 1890), 14, 15. Colin Heywood, ‘Society’. In The Nineteenth Century: Europe 1789-1914, edited by T.C.W Blanning (Aldershot: Ashgate Publishing, 2001), 61. H. G. Wells, The Time Machine: An Invention (London: William Heinemann, 1895), 37. K.R. Swafford, ‘Resounding the Abyss: The Politics of Narration in Jack London’s The People of the Abyss’, The Journal of Popular Culture 39, No. 5 (2006): 841. Edwin Ray Lankester, Degeneration: A Chapter in Darwinism (London: Macmillan and Co, 1880), 62. Jack London, The People of the Abyss (London: Macmillan and Co., 1903). Jack London, The Iron Heel (London: Macmillan and Co., 1908). Alessandro Portelli, “Jack London’s Missing Revolution: Notes on “The Iron Heel”,” Science Fiction Studies 9, No. 2 (1982): 191; Francis Shore, “Power, Gender, and Ideological Discourse in The Iron Heel,” in Rereading Jack London, eds. Leonard Cassuto and Jeanne Campbell Reesman (Stanford: Stanford University Press, 1996), 91. Our London Reporter, “Panic in London: Police and Military Precautions, Warrants Issued for the Arrest of Socialist Leaders, Business Suspended, Meeting of the Unemployed, Interview with Mr. Hyndman,” The Manchester Guardian, February 11, 1886, 5. “The Police of the Future.” Punch, or The London Charivari, February 27, 1886. “The Rioting in the West-End,” The Times, February 10, 1886, 5. First published in 1890. William Morris, News from Nowhere; or, An Epoch of Rest. Being some Chapters from a Utopian Romance (Hammersmith: Kelmscott Press, 1892). Phillippa Bennett, “Riot, Romance and Revolution: William Morris and the Art of War,” Journal of William Morris Studies 18, No. 4 (2010): 25. #Outreach: A case study of the Portsmouth History Centre’s Outreach. Where the shadows lie: The Gothic in early-mid and late nineteenth-century London.